The Family of Ruby Sales – Ye watchers and ye holy ones . . .
An article in the local paper a few weeks ago caught my eye. It announced that Yusuf Salaam, a 1966 graduate of Carver High School in Columbus, Georgia, would be the speaker at the annual Heritage Bowl Unity Breakfast sponsored by the Carver and Spencer High School Alumni Associations on August 20. Carver and Spencer are two historically black high schools in Columbus. Spencer was the first, established in 1930. 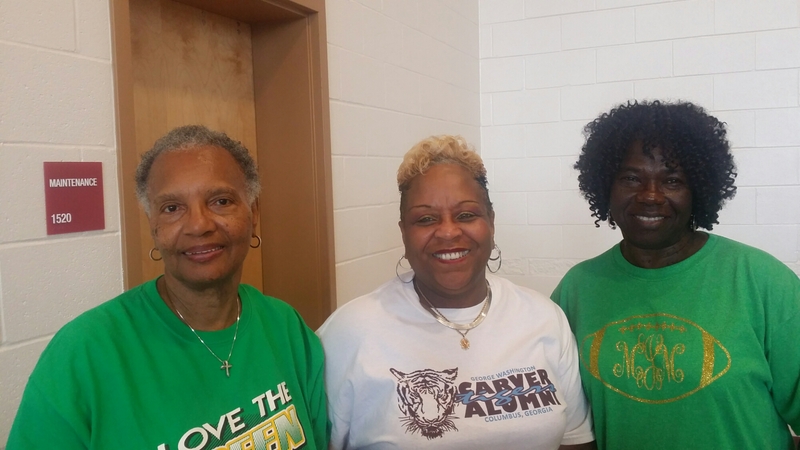 Carver was established as a junior high in 1954 and graduated its first high school class in 1963. The two have met on the football field since 1962 in one of the great rivalries of high school football. The Carver-Spencer game is usually one of the first games of the season, and always the best attended (I was told over 10,000 fans). Both schools produced several NFL players. A quick google revealed Gary Downs, Randy Fuller, Otis Sistrunk, and Moe Williams graduated from Spencer. Brentson Buckner, Roderick Hood, D J Jones, Tori Mobley, Nate Odomes, Isaiah Crowell, Jarvis Jones, and Chris Hubbard graduated from Carver. I’m sure there have been more from both, so there is some real talent on the field. The Unity Breakfast, held the Saturday before the Friday match up to kick off a week of Heritage Bowl festivities, started a few years ago. When Yusuf Salaam was a student at Carver, his name was Joseph Sales. He changed his name in 1975 when he converted to Islam. He is the younger brother of Ruby Sales, a civil rights worker who, with Jonathan Daniels, Joyce Bailey, and Rev. Richard Morrisroe, worked in Alabama to register people to vote. On August 14, after protesting in Fort Deposit, Alabama, the four were jailed with others in the Hayneville, Alabama jail. On August 20, 1965, they were released and went to Varner’s Cash store to buy sodas and try to use the phone. Tom Coleman met them at the door and raised his gun on the group. Daniels pushed Sales out of the way. Daniels was killed instantly. Morrisroe was critically injured but survived. Richard Morrisoe later recalled that Sales was smuggled back to Georgia in the trunk of a car. She was traumatized by the event and could not speak for weeks. She eventually testified at Coleman’s trial, in spite of threats against her and her family. Coleman was acquitted by an all white jury. All of this was happening while Ruby’s brothers were students at Carver High School. Daniels was killed August 20, 1965 (51 years ago today). That fall, Salaam (then Joseph Sales) started his senior year. Though they didn’t discuss the events of that summer at the breakfast, looking around the room I realized the Carver family was surrounding the Sales family through this nightmare. 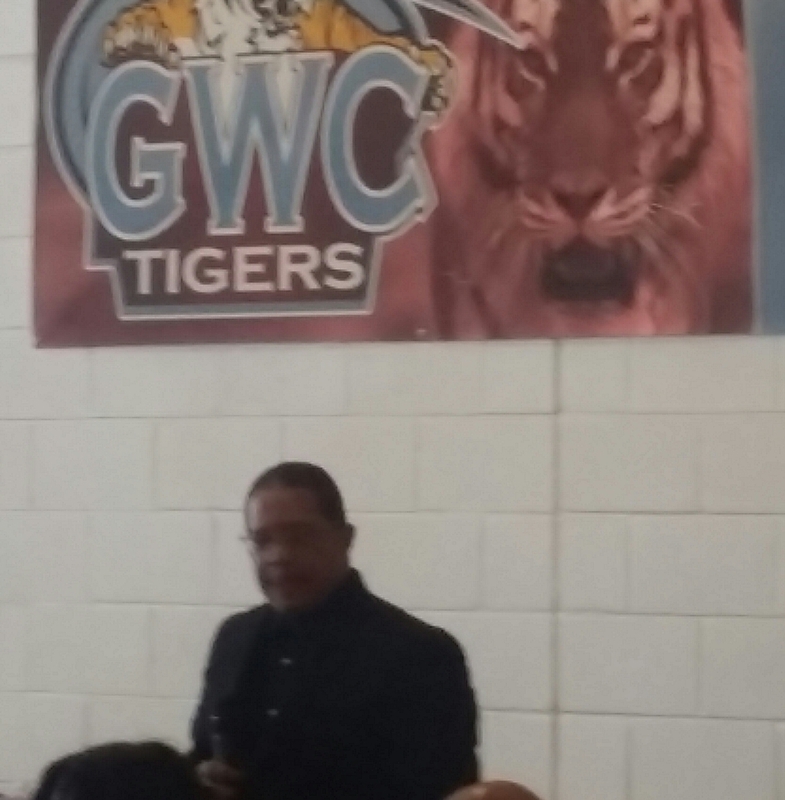 His younger brother, Ujjayyi Lifeflower (formerly Michael Sales, Carver Class of 1968) introduced his older brother at the breakfast. He spoke with brotherly pride. While their sister was preparing to testify at Coleman’s trial, Salaam was President of the Student Council at Carver. He asked everyone who ran against him to serve on his “cabinet,” turning rivals into friends. From there, Salaam became the first African American from Columbus to graduate from the University of Georgia in four years. He went to law school at the University of Miami. While there, he learned of some African American students who were in danger of failing. He formed a study group and helped them all graduate. He taught law in Wisconsin and Syracuse for a time, but then felt called to return to the South. So he came to Selma, Alabama where he again turned rivals into friends. He built a coalition of both black and white voters. He served as president of the city council in Selma, ran for mayor, and was eventually elected to the Alabama legislature where he served from 2002 to 2010. It was a great morning. 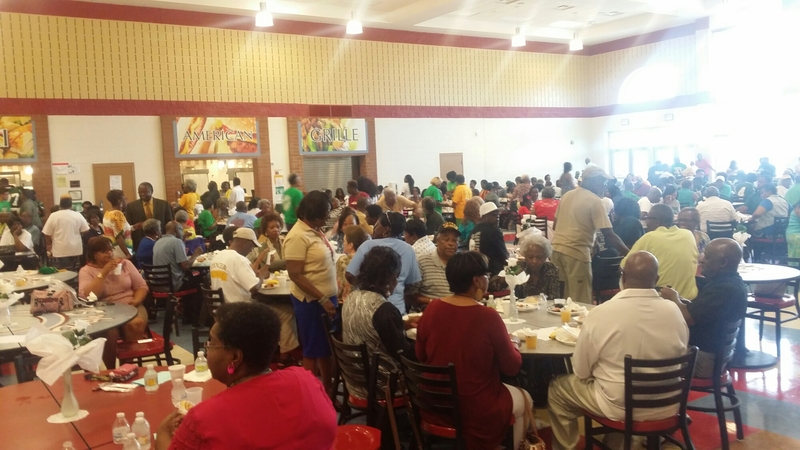 The cafeteria at Carver was packed. Carver fans and Spencer fans joked about the rivalry. The principals at both schools shared recent accomplishments – graduation rates are at all time highs. Carver is a center for STEM. Spencer had 158 graduates last year, and every student had a commitment post-high school for a 2 year college, a 4 year college, the military, or a job. Superintendent Lewis hinted that good news about ACT scores will be shared soon. Leaders from both schools were clear – while this rivalry runs deep, unity is the goal. Several alums recalled how both schools would fight hard to win on the field, but after the game both teams would meet at Burger King as friends. Alums from both schools are friends today – like my tablemates! After the program, I spoke with both Salaam and Lifeflower. I explained that I am an Episcopal priest in town and simply wanted to be there to hear them and honor their family’s witness. Ruby couldn’t be here this morning, but she lives in Atlanta and continues her witness for justice for all people. I invited them to St. Thomas any time – hope they will join us! 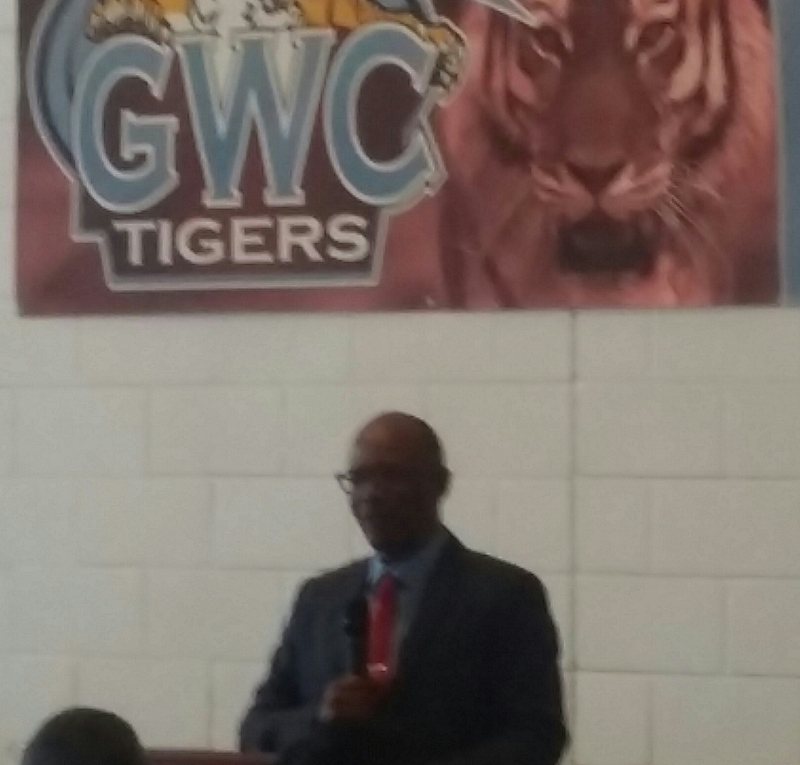 During his remarks, Salaam said, “The pioneers who loved us are dead and gone, but their spirit lives.” He recalled teachers and administrators and friends who touched his life. Many heads nodded. He didn’t quote this scripture, but it came to mind to me – Since we are surrounded by so great a cloud of witnesses, let us lay aside every weight, and the sin that clings so closely to us, and let us run with perseverance the race that is set before us. Hebrews 12:1. Emphasis on US. We are in this together. There are so many ways to work for unity – from rival schools hosting breakfast together, to politicians forming coalitions for the common good, to civil rights workers fighting for justice for all people. Behold how good and pleasant it is when God’s people dwell together in unity. Psalm 133:1. Fighting for justice is a High Calling! Thank you for telling this wonderful story…of a city, a people, a family, high school students…of differentiation and unity. I am inspired! Thank you, Barbara. I was glad to have the opportunity to share this.